Access this white paper from Ethan Edwards and learn the 5 specific strategies to improve your elearning instructional design! Get the 5 Critical Design Activities White Paper! Ask instructional designers to describe their design process and you will probably get a listing of five steps: Analysis, Design, Development, Implementation, and Evaluation. Those who have been trained or have done some reading will likely identify these components collectively as the ADDIE process, a process that has been at the core of the instructional design discipline for years. While the process outlined makes perfect sense at a high level, it isn’t in itself particularly helpful. It’s true that one has to engage in “Design” before one can “Develop” the final product when creating a piece of learning from scratch, but the specific way to approach the design is of critical importance. 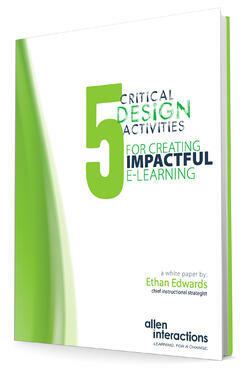 In this white paper Ethan provides five specific strategies to improve elearning instructional design.